I am very sensitive to any movements at sight. The initial stage is spot the trigger, alert, lunge, bark and the last but not least, bite. In short, I have movement reactivity. To my experience, the best way to overcome this is to use counter-conditioning then later on pair with desensitization. What you mean by counter-conditioning? It is basically a classical conditioning which pairs the triggers that will produce unpleasant response with something pleasant. In my case, we use YUMMY TREATS to pair with the triggers. Beside this, distance and intensity are also another important part of this training. That is why desensitization kicks in. The goal is to expose me to a low level trigger which will evoke the unwanted response in certain situation, and then gradually closing up the distance and slowly increase the intensity of the stimulus. This has to be done by my own pace so that none of the unwanted behaviours will occur. How do I start? Firstly is to locate the trigger, make plan and train at a safety distance. In my case, since I am reactive to moving things, I will start with human first as Mommy does not want me to bite at any human being accidentally. She will pick an odd hour (such as 7am during the weekday) for me to watch at people who is standing still, then followed by slow walking people and then normal walking people. 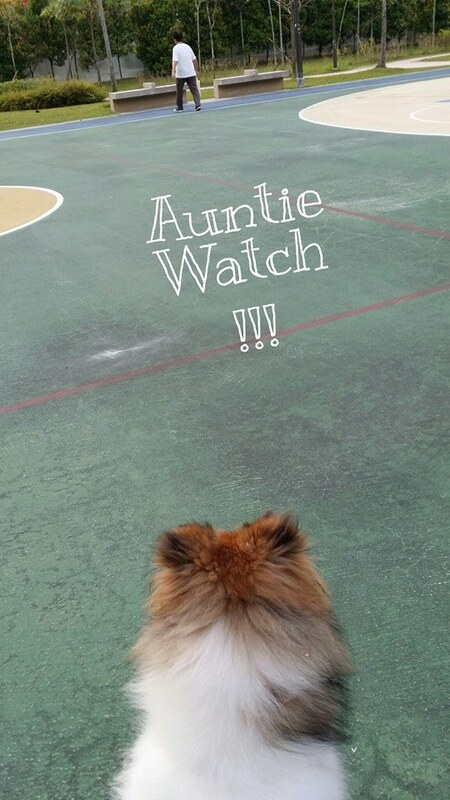 Today, I will just watch at slow walking auntie. The best is to train at one stimulus at one time in one day. In order to be more effective, keep the training session short like 15 mins. In between, you can have a short break so that I could redirect the focus from the stimulus in order to rest my mind. See you in the next session with me.